In this graphic, the size of the crop squares are relative to each other. The numbers are in million tons. Rice, wheat, pulses, coarse cereals, sugarcane. oilseeds and the fibre crops are the major categories for the 2014-15 crop production targets. 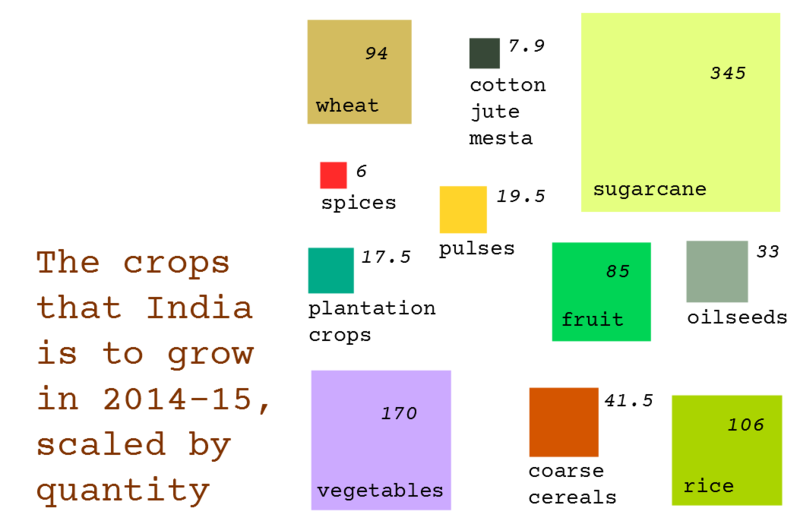 What is always left out from the ‘foodgrain’-based projections are vegetables and fruit, and these I have included based on the 2013-14 advance estimates for horticultural crops. 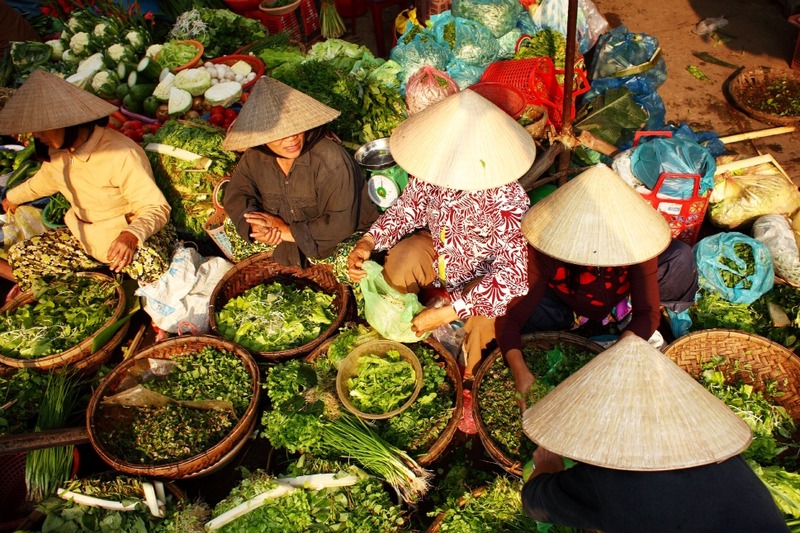 Your allocation for the year could be 136 kilograms of vegetables, provided the monsoon holds good, which at this point in its annual career does not look likely. We need the veggies (not just potato, onion, cabbage and tomato) as much as fruit. But the central government is more traditionally concerned with ‘foodgrain’, by which is meant rice, wheat, pulses and coarse cereals. That is what is meant by the ‘foodgrain production targets’, which have been issued by the Ministry of Agriculture for 2014-15 – as usual with scant sign of whether the Ministries of Earth Sciences and Water Resources were invited to a little chat over tea and samosas. I would have expected at least a “what do you think dear colleagues, is 94 million tons of wheat wildly optimistic given the clear blue skies that o’ertop us from Lutyens’ Delhi to Indore?” and at least some assenting murmurings from those foregathered. But no, such niceties are not practiced by our bureaucrats. So the Ministry of Agriculture gruffly rings up the state agriculture departments, bullies them to send in the projections that make the Big Picture add up nicely, sends the tea-stained sheaf to the senior day clerk (Grade IV), and the annual hocus-pocus is readied once more. 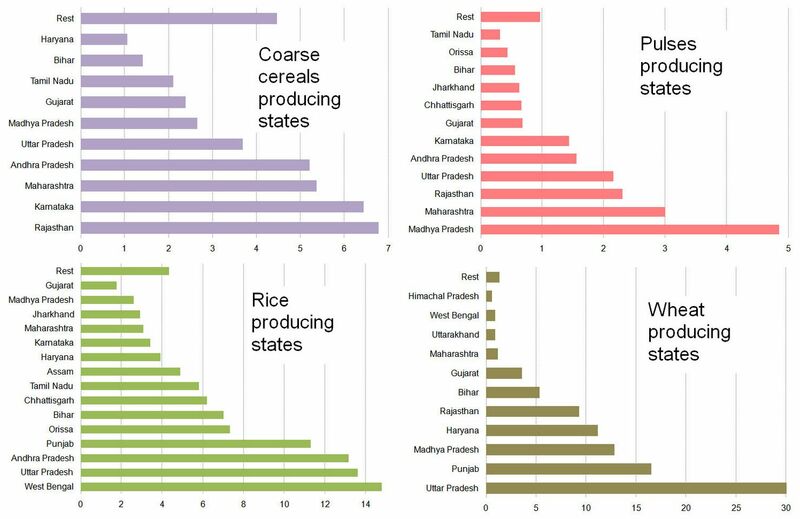 What the departments in the states say they are confident about is represented in the chart panel below, which shows you for rice, wheat, coarse cereals and pulses the produce expected from the major states. The question is: will monsoon 2014 co-operate? 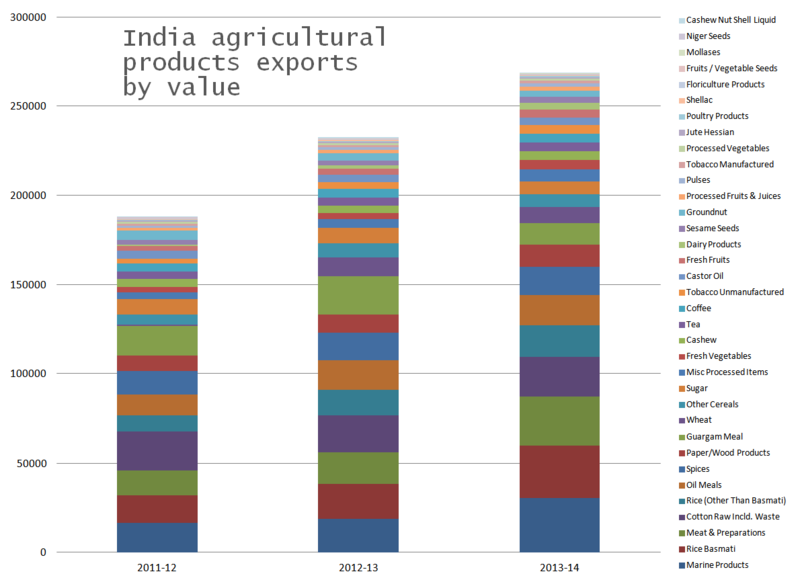 In 2013-14 India exported agricultural products worth Rs 268,469 crore, according to data from the Department of Agriculture and Cooperation (Ministry of Agriculture, Government of India). 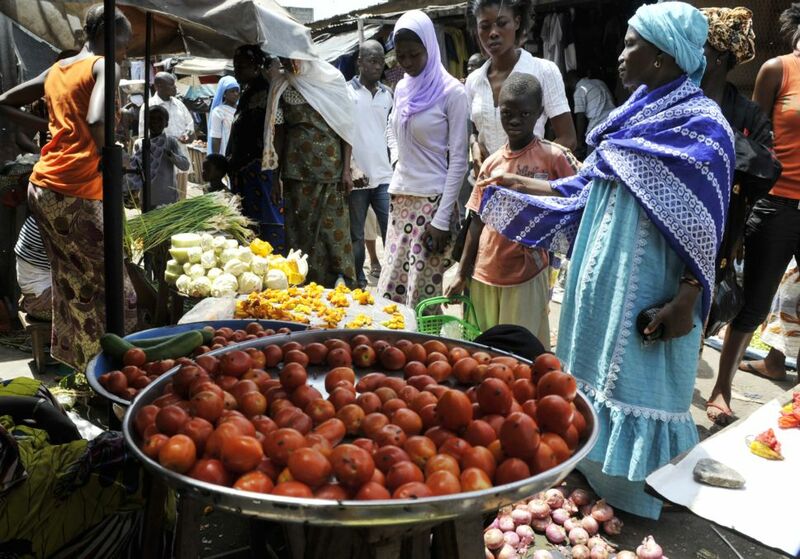 Marine products, basmati rice and meat were the major export earners. This amount is equivalent to around 44.67 billion US dollars. There are, as usual, problems with the data. The ‘meat and preparations’ category, the third biggest earner with Rs 27,247 crore, has no quantity figure. Nor does ‘paper/wood products’, the eighth biggest earner (Rs 12,529 crore). Nor do ‘miscellaneous processed items’ (Rs 6,882 crore) or ‘fresh vegetables’ (Rs 5,117 crore). Here are the top earners by value for 2013-14: Marine Products (Rs 30,617 crore), Rice Basmati (Rs 29,300 crore), Meat and Preparations (Rs 27,247 crore), Cotton Raw Incld. Waste (Rs 22,248 crore), Rice (Other Than Basmati) (Rs 17,493 crore), Oil Meals (Rs 17,034 crore), Spices (Rs 15,981 crore), Paper/Wood Products (Rs 12,529 crore), Guargam Meal (Rs 11,734 crore). These are the earners above Rs 10,000 crore. Here are the major quantities exported in 2013-14, in thousands of tons: Rice (Other Than Basmati), 7,019; Oil Meals, 6,564; Wheat, 5,560; Other Cereals, 4,609; Rice Basmati, 3,757; Sugar, 2,460; Cotton Raw Incld. Waste, 1,941; Spices, 1,029; Marine Products, 999; Guargam Meal, 602; Castor Oil, 545; Groundnut, 512; Pulses, 343; Sesame Seeds, 257; Coffee, 254; Tea, 248; Tobacco Unmanufactured, 237; Mollases, 212; Cashew, 121. What is still quaintly called an “advance estimate” (the fourth of four that are released by the brobdingnagian agricultural bureaucracy in India) has been made public. 1. Rice 104.32 million tons, wheat 93.90 mt and coarse cereals 42.01 mt for a combined cereals total of 240.23 million tons. 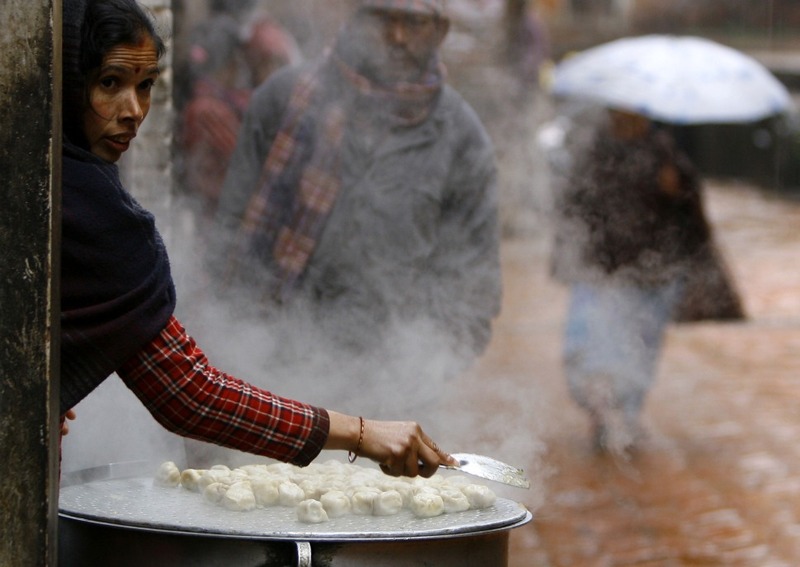 Add 17.21 mt of pulses for a total foodgrains estimate of 257.44 million tons for 2011-12. 2. A total for nine oilseeds of 30.01 million tons (groundnut, castorseed, sesamum, nigerseed, rapeseed and mustard, linseed, safflower, sunflower and soyabean). Sugarcane is 357.66 million tons. For fibres, cotton 5.98 mt, jute 1.96 mt and mesta 0.12 mt. What about the effect of the poor 2012 monsoon on sowing and harvests, and have the drought conditions and water scarcity in over 300 districts been factored into these numbers? I don’t know. The agri and crop and food babus in India (just like ‘mandarins’ and ‘eurocrats’ elsewhere) aren’t telling. Sell-off in grains and oilseeds ‘an over-reaction, reported Agrimoney on 25 February 2011: The sell-off of in grain and oilseed markets in response to the Libyan crisis is an over-reaction, with tight supplies, particularly of corn, warranting continued high prices. The Canadian Wheat Board said that the Libyan unrest “in reality, does not materially change the grain fundamentals facing the market”, even through the global economic fears it has provoked through lifting oil prices. Hedge Funds Cut Food-Price Bets as Grains Take a Fall, reported Bloomberg on 25 February 2011: Bullish bets on soybeans fell 18 percent and those for corn slid 3.4 percent. Holdings in eight agriculture commodities by money managers are higher than during the global food crisis three years ago. Investors put a record $2.6 billion into agriculture-index swaps, exchange-traded products and medium-term notes last month, after pouring $5.7 billion during the fourth quarter of 2010, according to Barclays Capital. In the week ended Feb. 8, hedge funds and other speculators increased bullish bets on wheat to a combined 51,787 futures and options contracts, the highest since August 2007. Russia could prolong grain export ban: deputy PM, reported Business Recorder on 22 February 2011: Russia on Tuesday said it may extend a ban on grain exports that has been blamed for triggering global food price rises beyond its provisional expiry date of July 1. “We discussed the option of extending the grain export ban after July 1,” news agencies quoted First Deputy Prime Minister Viktor Zubkov as saying. Analysts link the spike in wheat prices to subsequent jumps in the cost of both Russian dairy products and beef. Pakistan: Govt expects bumper wheat crop, lacks proper storage, reported Asian Pulse on 17 February 2011: Government has set wheat procurement target of 6.5 million metric tons expecting a bumper crop estimated to be 23.5 million metric tons for 2011 wheat season. The Government of Pakistan, while ensuring minimum wheat support price of Rs.950/- per 40 kgs to the farmers, procures around 28 to 30pc of the total crop to safeguard the interests of the farmers whose efforts have made the country not only self-reliant but also enabled to export the surplus wheat this year. India Foodgrains Production in 2010-11 Estimated at 232.07 MT ; 2nd Advance Estimates of Crop Production Released, reported the Press Information Bureau on 9 February 2011: The second advance estimates of crop production for 2010-11 have been released. India is likely to produce 232.07 million tonnes of foodgrains during 2010-11 compared to 218.11 million tonnes last year. This is only marginally below the record production of 234.47 million tonnes of foodgrains in 2008-09. India is likely to achieve record production of wheat (81.47 million tonnes), pulses (16.51 million tonnes) and cotton (339.27 lakh bales of 170 kg. each) this year. Central Statistics Office (CSO) has estimated that the agriculture, forestry and fishery sector is likely to show a growth of 5.4% in its GDP during 2010-11, as against the previous year’s growth of 0.4%.